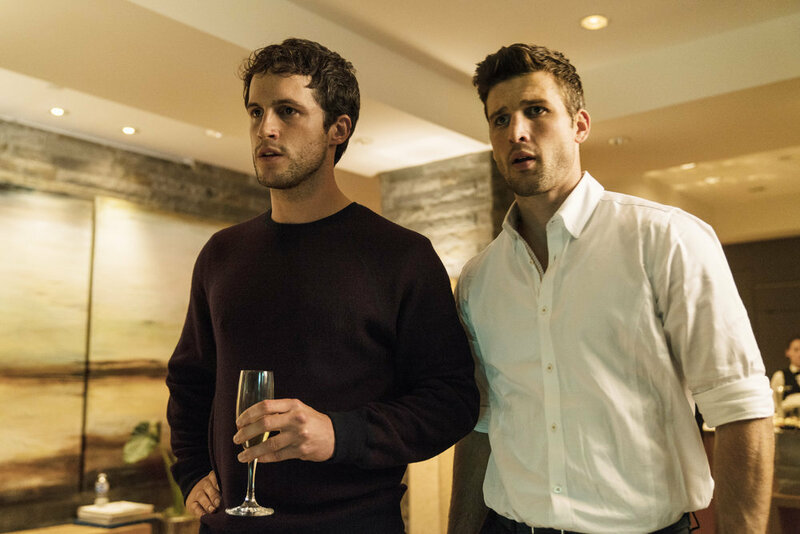 Have you been watching Imposters on Bravo? If not, you should be. It is a smart, fun, clever show about a group of con-artists and their disgruntled victims. At the winter TCA presentation, cast members Stephen Bishop, Rob Heaps, Inbar Lavi, Marianne Rendon, and Parker Young joined Paul Adelstein and Adam Brooks on stage to talk about season one. Imposters airs Tuesdays at 10/9c on Bravo. For Inbar, you have to be a chameleon for this role. What did you do to prepare? Inbar Lavi: Well, I got very, very, very lucky when I met these two wonderful creators and writers. I somehow managed to convince them that I could pull this off. And I grew up in Israel. My dad is Polish. My mom is Moroccan, and I grew up around all kinds of different languages, and I love playing with it, and I love picking up new melodies, and I got really lucky to try and maneuver different ones throughout the season, and it’s just been such a thrill, so much fun. As Ava, you have a French accent. Was that something you had experience with? 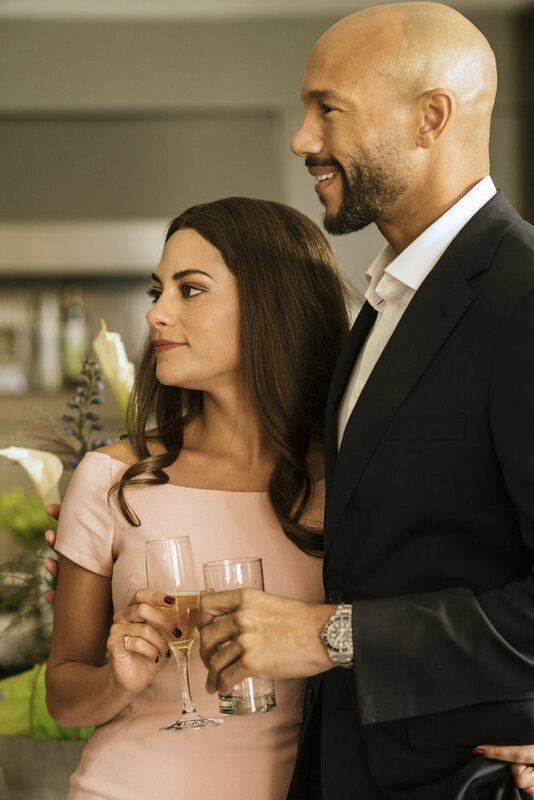 Inbar Lavi: It’s Belgium, actually, and you know, my grandma is Moroccan, and she spoke French and Arabic, and I got lucky in that sense that I got to pick some of that up, and we were very fortunate to have wonderful voice coaches on the show for me and Rob for different characters, and I just closed my eyes and jumped into it and hoped for the best, and hopefully it sounds all right. Rob Heaprs: You wanted to be English, as well. You wanted one of the characters to be English at one stage, I think, and you wanted me to record it. Inbar Lavi: I did. I did. For Paul and Adam, there are between four or five current con men/con women shows on TV, what do you think is the allure? Paul Adelstein: We don’t really track that, and as we started talking about doing this together, we kind of talked about what we love about identity stories, which is obviously part of the fun of doing con artist stories, and we had very similar tastes, and we’d drawn very similar kind of elements and our favorite movies that we talked about a lot, so it was really about creating our own world where this could exist. Mr. Adelstein, how are you scheduling this with your being on several other shows as an actor? Paul Adelstein: There’s a cloning device I want to talk to you about. It was just always kind of part it was just built in here. Adam and I met during “Girlfriends’ Guide to Divorce” when I was acting on it, and he directed the pilot, and he was doing other things and I was doing other things, and we just kind of found the time, and that’s just you just do the work, and you’re lucky it’s a good problem to have. Where do you hope our sympathies lie amongst the various characters for both of you? Paul Adelstein: Well, hopefully it’s constantly shifting. I think one of the things that Adam was just talking about in answering the other questions was that one of the fun things about this is that the audience, the carpet can shift under the audience the rug can shift under the audience’s feet every now and then, and that’s a really fun thing to do. For instance, in the pilot, you think, well, this is a bad person. This is a criminal, and then you find yourself being sympathetic for Maddie. Then even with Ezra and Richard and Jules, they do some questionable things, even though you are sympathetic towards their plight, and we kind of wanted to have that reality where it’s constantly shifting. Adam Brooks: Plus I think the show is a little bit about how well can you know anybody? How well do you really know your girlfriend, your boyfriend, your wife? I’ve been working with Paul the last few years. I still don’t quite get him. So characters are always revealing themselves in ways that are unexpected, and then also, it’s a show about reinvention. It’s that feeling of, like, you could drive by an airport and think, “If I just got on a plane and went somewhere, I could be anybody,” and a lot of these characters are reinventing themselves. And the way they reinvent themselves can sometimes make you sympathetic to them in a way they weren’t before, or unsympathetic, and we think part of the show that that’s constantly shifting, your relationship to who they are. For Paul, what spurred you to want to take a producer role in this show? Paul Adelstein: Well, Adam had been working on this idea, and we really kind of…I basically followed him around the set of “Girlfriends’ Guide” asking him questions because I was a fan of his. Paul Adelstein: It was a little weird. And then we kind of realized we had very similar tastes, and he said, “Do you want to do this thing with me?” And I said, “Yes.” I think he had read the episode of “Girlfriends’ Guide” that I wrote. In that way, obviously, I already had a relationship with UCP and Bravo, and that was kind of a natural fit. There are real life stories of grifters and people not being who they seem. Do you think people are somehow blinded into not seeing the truth? So I think I maybe haven’t seen as many of those news stories, but I definitely know how it feels to invest everything in something and then for it to be pulled away from you to be left feeling worse off than you were before, because you’ve fallen for it. One of the taglines of the show is love is the greatest con of all, the idea that, yeah, you give somebody your complete trust, and they run off with it. Parker Young: I saw a documentary the other day about this family who lost their child. He was kidnapped, and then they got a call three years later saying he had surfaced in Spain, and it was just some imposter pretending to be their kid. Paul Adelstein: I saw that. What’s that called? 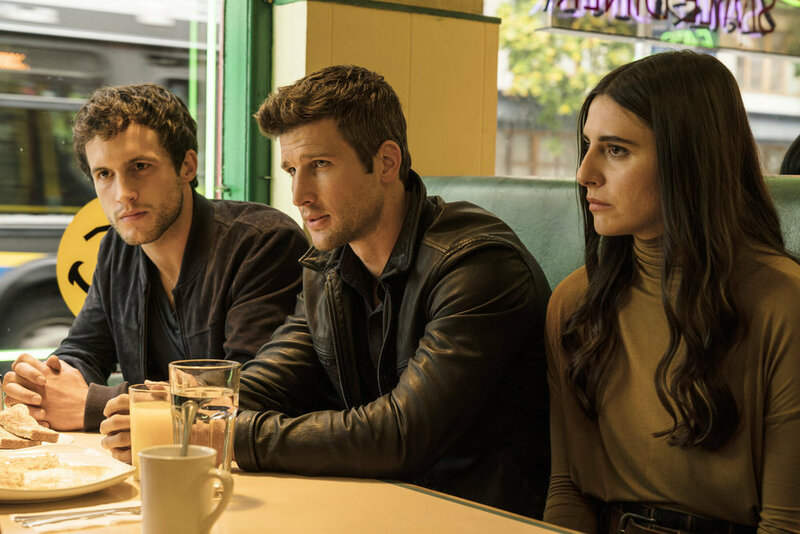 Parker Young: It’s called “Imposter,” and this was a kid who just wanted to be loved, and he was 23 years old pretending to be 16. He is Spanish pretending to be this Texan child, and he goes back, and the family just welcomes him in, and it’s just that’s not your kid. You have to know it’s not, but they just were willing to believe it because they wanted it so badly. And with all of us, she offered something that we needed, something that we wanted to believe in because it made us better than what we were already. So when she leaves, we’re stuck with a broken heart, with, literally, our better half missing, and so we’re looking not just for her, not just for our money, but we’re trying to find out who we are in the absence of this better half. Inbar Lavi: I guess what I would say to someone who’s been hurt and what I would hope that people can take away from this show, everyone on this show gets hurt. Everyone is deceived. Everyone is a little bit conniving, and I hope that people can take some kind of message that, “That’s okay. It happens. Clean yourself off. Get back out there. There’s always hope. You might still find someone who won’t hurt you. You might…” That’s what I would want people to take from it at least. For Rob and Parker, are you enjoying playing amateur scammers? Rob Heaps: Yeah. Well, didn’t Fellini say that if you want to convincingly be bad at something on screen, then you actually have to be really good at it, which wasn’t the case with us. Rob Heaps: Genuinely bad at this stuff, and somehow it’s translated on screen, which is great. Parker Young: Yeah, it was fun. It’s a blast to go on this journey. I’m…correction: I’m not bad. He’s bad. I’m just trying to teach him throughout this journey. Inbar Lavi: Well, you look good doing it, so that’s all that matters. Rob Heaps: We’re learning from each other. I’m teaching you about sensitivity and wisdom. Marianne Rendon: They needed a woman to get it right. Paul Adelstein: Very much entry level. Rob Heaps: Sharky and George. Adam Brooks: Yeah. Well, we wanted to be–we thought about Newman and Redford, Clooney and Pitt, and Rob and Parker. I don’t know. Parker Young: Like Batman and Robin. Stephen Bishop: As you can tell, they have no chemistry. Rob Heaps: No, no chemistry at all. Marianne Rendon: Abbott and Costello. For Inbar, what was the hardest part for you so far that you had to shoot? Inbar Lavi: How long do we have? I guess the hardest thing for me was to really find Maddie, and I don’t think that I’ve found her yet. Maddie is the core of it all. She’s the backbone, and she’s what all the branches of the different characters come from. And so I wanted to make sure that I got her grounded and secure. And throughout the season, I realize I was really nervous because I wasn’t getting her, and I realized that it’s OK because she doesn’t know who she is either quite yet, and that’s a big question that goes throughout the season. I think that a lot of people can actually relate to that. It was challenging for me, but I think that’s OK.
Paul Adelstein: I think that that goes to the question that was asked before is how can this happen to somebody? One of the things that Maddie is brilliant at, as great con artists are, is seeing that thing that the other person needs and being that thing that the other person has wanted. She is those different things for all the people that she has scammed. Now, one of the things that we’re examining, too, over the course of the season I think Inbar touched on it is that doesn’t necessarily mean in her own life that she knows who she is, what she wants, who she would fit with. When she meets somebody that she may have actual real feelings with, that’s very confusing because fiction is much different creating a fiction is much different than actually having a human connection with somebody because you have to be vulnerable, right? How far are we diving into the backstories of the characters during the first season? 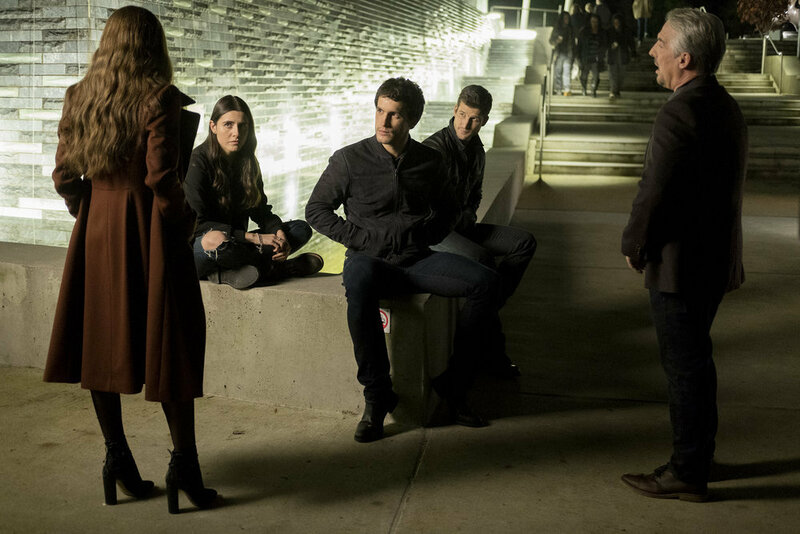 Adam Brooks: Over the course of the season, those stories unfold in different kinds of ways, sometimes in flashback, sometimes because, as Ezra and Jules and Richard catch up to try to catch up to Maddie, they stumble on things from her past. So we’re really we’re very much interested in what happened with those stories and trying to, again, do it in a very specific way that feels really kind of real and understandable and not clichéd. So that will unfold over the course of the season. When you’re thinking about casting, do you go first to people who you’ve worked with before? Paul Adelstein: Yeah. For instance, I worked with Brian Benben for six years on a show, and we always thought of him for Max, and that turned out to be a very wise choice. He’s wonderful. Marianne, the producers were saying that Maddie is very good at finding the hole in the heart, filling it, and all. Your character, where is the hole in her heart? Marianne Rendon: Well, I do not know. Jules is a spoiled, rich girl. Grew up very privileged. She pursues the life of an artist. So she seeks legitimacy and a toughness and an abandon to self confidence. She meets the love of her life, Cece, who embodies that perfectly and really inspires her to have that confidence and that edginess and becomes that person as well. And then once Cece leaves her, she has no idea who she is. Is Jules is looking for a muse? Marianne Rendon: She’s looking for someone who inspires her to feel like a legitimate artist. What’s her relationship with the guys? Marianne Rendon: I think at first, she’s not very impressed with them. Rob Heaps: Why? What’s missing? Rob Heaps: What, you do? Rob Heaps: I didn’t notice. Marianne Rendon: There was no way that they could have done it without Jules. Parker Young: And vice versa. Marianne Rendon: So it’s a good thing that they found me ultimately, because they were a little lost. Rob Heaps: No, we found you. We weren’t lost. We found you. We weren’t looking for you. We were looking for her. Marianne Rendon: …your guiding light. Rob Heaps: It’s a collaboration. Adam Brooks: For Paul and I, in writing it, we thought this is also a show about families, the family that you have, the family that you choose. There’s all these shifting little groups. The three of them, after a rough start, make up a kind of family together. Then Maddie is part of another family of con artists that sort of works like a family too and has its conflicts and issues. That’s one of the things we really like in writing it, is having these things shift as these little collectives form and then disappear.